Learn How to Talk About Failure in a Highly Productive Way – Kathy J. Marshack, Ph.D.
Have you heard the expression, “Fail Fast”? 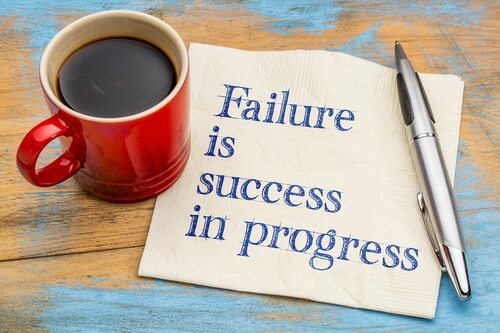 It’s a catchphrase that today’s entrepreneurs use to remind themselves that failure isn’t a bad thing, because it informs us on ways we can improve as individuals and companies. If we learn from failure, we can work on a better product, a stronger strategy, and a clearer sense of purpose, and what we need to do to achieve our dreams. Failure cultivates humility, builds resilience, and breeds courage.But for failure to do the most good, we have to be willing to talk about it. In fact, research shows that talking about failure can make us happier and more productive. Even if you’re the type of person who wants to hide every mistake; even if you feel overwhelming shame and embarrassment; or even if you physical cringe and feel sick when you think about it – you can learn to see the positive in a failed situation. 1. Focus on the fact that face-to-face conversations around failure are opportunities to build stronger connections among colleagues. 2. Frame the incident as, ‘Can you help me?’ This dignifies the person as knowing more than you and activates the spirit of helping. 3. Remember that discussing failures humanizes you by showing that you’re not perfect. This makes you more approachable and relatable. 4. When you look for the positive in a failed situation, you develop greater empathy for others when they fail. 5. Failure identifies processes and protocols that aren’t complete, so it provides an opportunity to improve on them. It takes the Resilience Factor to frame failure as a positive learning experience. If you work with your spouse in a family business, it can be especially difficult to discuss failures, because it affects not only your business life, but your home life too. However, it’s critical that you don’t hide your failures. Learn to use them to draw you closer to your business/life partner. If your family company doesn’t have a culture that welcomes this kind of openness, it might be beneficial for you to start working with a family business coach. If you live near Portland, OR/Vancouver, WA please contact my Jantzen Beach office and schedule an appointment. I also offer online therapy if that works best for you. Previous PostPrevious What Makes You So Afraid to Speak Around Your Aspie? Next PostNext Expats – Do You Know How to Ask for Help?